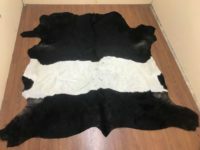 These low grade calf skins are intended for people who would like to turn their hand at making crafts out of them. Whether that be purses, cushions, handbags etc. They are various sizes and various colours. The price is $40 /piece. Let us know what colours you are looking for and we will endeavour to supply you with those colours. We have black/white, Black, Brown, Tan, Brown/white.